Anthony Milner is, sadly, something of a peripheral figure in British musical circles these days. I know him mainly through some of the dignified and eminently practical music that he wrote for the Roman Catholic liturgy, especially after vernacular worship was introduced after the Second Vatican Council in the 1960s. Paul Conway, who has written the booklet essay accompanying this CD, contributed an appreciation to MusicWeb International some years ago, following Milner’s death; that is well worth reading as an introduction to this composer. His music is sparsely represented on CD. There was a 1984 recording of his First Symphony and Variations for Orchestra, which I’ve not heard (review). That’s still listed on Amazon though I don’t know how easy it is to obtain otherwise. His early Salutatio Angelica and his cantata Roman Spring are definitely available on a very valuable Lyrita disc (review) and readers may be aware of other recordings. However, this issue from the Richard Itter collection of off-air recordings is a highly important addition to Milner’s limited discography. The Song of Akhenaten is an interesting piece. It’s scored for soprano and a chamber orchestra consisting of single woodwind, horn, trumpet and strings. I was intrigued to read in the booklet that in its original incarnation the accompaniment was provided by a three-man percussion ensemble. By 1956 the score had been revised into the form we hear on this disc. That must have been a pretty thorough revision because the accompaniment is very melodic. I find it hard to imagine the score in its percussion guise. The words are Egyptian in origin. Milner assembled them from two sources, both in English translation: a prayer inscribed on the coffin of Pharaoh Akhenaten (1380-1362 BC) and the Hymn to Aten, which dates from around the same time. These are monotheistic texts. Milner divides the work up into six sections. At the start the soprano voice seems to emerge seamlessly from an opening horn solo. The first section, ‘Beautiful is Thy dawning’ grows into a very intense prayer. A section of very swift music follows immediately (track 1, 2:16). Here a variety of animals are listed, all of them praising the deity. The writing for both the soloist and the orchestra is agile; this is a lively dance of praise. One of the most impressive passages in the work is an Adagio which forms part of the second section (track 2, from 1:56). Here the music takes on a new, much darker hue. The words are a night hymn and the writing for the soprano is very expressive indeed. Janet Price successfully portrays a supplicant who is awestruck in the face of the power of the deity. A lighter, happier tone is struck at the start of the third section but the closing lines (“I shall breathe the sweet breath which comes from Thy mouth”) brings about a solemn close. Here the music is intense once again and this closing section is moving. Janet Price gives a very fine performance indeed, her singing full of expression. The orchestral accompaniment is somewhat muddy and slightly relegated to the background but one can still get a good impression of the score. The largest-scale work here is The Water and the Fire. It was commissioned for the 1960 Three Choirs Festival, which took place at Worcester. However, illness prevented Milner from completing the work in time and the premiere was postponed until the 1964 Hereford Festival. Milner’s score is nothing if not ambitious. It’s cast in four scenes and the text, which he compiled himself, draws on a variety of sources, including Scripture, the Confessions of St Augustine and the writings of St John of the Cross and St Teresa of Avila. I can best describe the scheme of the work as a journey of a man’s Soul to salvation. In Scene I ‘Descent into the Pit’ the man is in despair. In Scene II, ‘Encounter’, the encounter is between the man and Christ on his way to the Cross. Scene III ‘The Waters by Night’ is a brief interlude. The final scene ‘The Easter Fire’ is the most extended, accounting for nearly half the work’s overall length. In this section Milner picks up a number of ideas from the Roman Catholic Easter Vigil liturgy. His music is tonal, though often he uses dissonance to heighten the effect of the music. The work is certainly accessible though it makes demands on both the performers and the listener. The first scene, ‘Descent into the Pit’ opens with a highly dramatic soprano solo. Her lament is desperate in tone and the musical language is tough and dissonant. The choir takes on the argument in a similar vein. The tenor, representing Man, has similarly troubled words and music (“I looked for peace, but no good comes”). His music is jagged, as is the accompaniment. As he sings the words “I looked on the earth, and lo, it was waste and void” the tempo slows but the music becomes, if anything, even more tense. There follows a depiction of a storm, first by the choir and then the tenor. Clearly this is all a metaphor for the turbulence in the man’s soul; he is drowning in a sea of sinfulness. Then the tempest stills as the soloist sings “Have mercy on me, for I know my transgressions”. The remainder of this section is then a supplication for forgiveness. A passage for the strings leads without a break into the second scene, ‘Encounter’. Now the mood of the music is subdued but apprehensive. The chorus describes Christ on his way to execution and there follows an encounter between the man and Christ, who is personified by the baritone. Initially Milner sets this meeting to music that is oppressive, tragic and, on the man’s part, guilt-filled. However, as the baritone sings “It is I, the Lord thy God” a note of reassurance is struck and the tenor breaks into a rapturous setting of St Augustine’s words, “Late, late have I loved Thee”. Notwithstanding this rapture the final exchanges between the two characters take place to music that is pensive and somewhat dark. Again without a pause, Scene III follows. This is by far the shortest section. Essentially it’s a soprano solo though the men of the chorus interject a brief refrain from time to time. The words are by St John of the Cross and Paul Conway accurately describes the movement as “a pause in the unfolding of the drama, a period of waiting expressing hope and trust, symbolising the interval between Christ’s death and resurrection.” The music is lyrical and very intense. Hazel Holt is excellent, investing her lines with great feeling. Much of Scene IV, ‘The Easter Fire’, explores ideas that will be familiar to anyone who has attended the Roman Catholic Easter Vigil service. First we hear low-pitched material on the brass; surely this symbolises the tomb? Then a solo treble sings “Lumen Christe”, exactly as a deacon does when carrying the newly-lit Paschal candle into a darkened church at the start of the Vigil. A chorus of trebles responds “Deo gracias”. Punctuated by orchestral episodes, the call “Lumen Christi is twice repeated and on the fnal repetition it’s the full choir that answers. The music that follows sets an English paraphrase of the Easter proclamation, the ‘Exultet’. First we hear the tenor and then the chorus joins in to swell the hymn of praise. The hymn builds from fairly quiet beginnings to a great climax on the words “all is made new”. 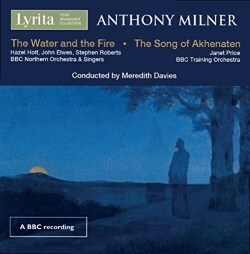 Milner now departs, one might say, from the sacred to words that blur the line between sacred and secular as the tenor and soprano soloists sing an ecstatic duet to words from "The Song of Songs" (“Arise, my love, my fair one…”) Here the music is light and airy; Milner’s invention is Spring-like in its eagerness. The duet is punctuated by cries of “Alleluia” from the choir. Reverting to the overtly sacred, Milner then has the tenor sing in Latin the start of the Easter Vigil Preface, preceded by the Preface dialogue. In time the setting moves into English and the chorus and soprano soloists join in. Where the Latin setting had employed plainchant in the vocal line, once we move into English the music is wholly original. As this Preface section progresses there is increasing joy and fervour to be heard. Then, continuing the Easter Vigil scheme, Milner moves from the Preface to the Sanctus and Benedictus. Here, I understand from the notes, he bases the music on his Mass, Op. 3 (1951) for a cappella SATB choir. Between the Sanctus and the Benedictus Milner interpolates a subdued but intense orchestral interlude, which moves from the top to the bottom of the orchestra. This orchestral passage is rather unexpected at a first hearing but it’s effective. During what is in essence the Communion rite Christ reappears and against a mystical accompaniment the baritone delivers a final lyrical benediction. At 23:23 we reach the final section of Scene IV. The trebles begin a setting of words by St Teresa of Avila (“Let nothing disturb you, nothing affright you…”). These closing pages, which involve the full ensemble, are reassuring and radiant. There’s no little beauty in the writing and the work achieves a tranquil close. I’m conscious that in describing Scene IV I may have made it seem like a liturgical setting. That’s not the case but Milner has discerningly used elements from the structure of the Easter Vigil service – a liturgy which unfolds with a wonderful logic to it, I always feel – to give structure to his own compositional ideas. Considering the work as a whole I would have to say that if you can respond to Milner’s religious sentiments, especially in Scene IV, that should bring you to a particularly full appreciation of The Water and the Fire. However, it’s certainly not essential to subscribe to the religious beliefs that underpin the score to be able to appreciate it as a work of art. Paul Conway sums up The Water and the Fire as “a truly visionary piece” and now that I’ve had the chance to hear it I agree. It’s a very skilfully constructed score of no little eloquence. The texts have been discerningly chosen and the music is as compelling as it is sincere. I’m delighted that it is now widely available through this CD. As to the performance, it’s mostly very good. The three soloists all do a fine job and the BBC Northern Symphony Orchestra, the forerunner of today’s BBC Philharmonic, plays very well. Meredith Davies was well qualified to conduct the score because he’d previously performed it twice in London. The choral contribution is possibly the least satisfactory component. The BBC Northern Singers sing well enough but the trouble is I don’t think there are enough of them. My recollection of the ensemble - from when I lived in the North of England at the time of this recording – is that it was essentially a chamber choir. For this assignment they were probably augmented but the size of the choir is not, to my ears, commensurate with the size of the orchestra. To compensate, it seems that the microphones were placed quite close to the singers, which isn’t quite satisfactory. It should not be forgotten that Milner conceived this work to be sung by a large chorus – the Three Choirs Festival Chorus – in a resonant cathedral acoustic. The boys from Manchester Grammar School aren’t always unanimous and precise in their tuning though the soloist is valiant and a reasonable attempt has been made to achieve the distancing of the trebles desired by the composer. Richard Itter’s recordings have been well transferred and re-mastered although there’s a note in the booklet warning of some tape distortion in The Water and the Fire. I can’t say that bothered me unduly. However, with both recordings one is conscious that we’re listening to sound that is some four decades old. I don’t know what venues were used. I seem to recall that the BBC Training Orchestra was based in Bristol so perhaps a Bristol studio was used for The Song of Akhenaten; certainly the sound is that of a studio. I wonder where The Water and the Fire was taped? Again, it sounds like a studio recording; a bit more resonance around the sound would have been welcome. However, in the case of both works the sound is still perfectly acceptable and you can get a very good idea of both the music and the performances. As this is a Lyrita release it almost goes without saying that the documentation is excellent. The texts are clearly laid out and Paul Conway’s essay is up to his usual impeccable standard. There is one small slip in the otherwise comprehensive documentation. On the track-listing the date of Milner’s death is given as 2003; the correct date is 2002, as stated in Paul Conway’s notes. This is another important release, giving us a very welcome opportunity to hear two eloquent scores by Anthony Milner in dedicated performances.